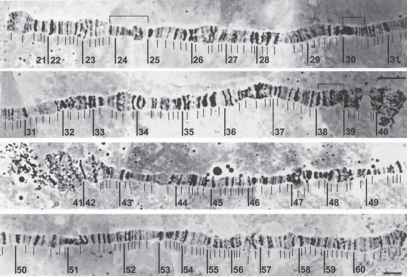 The central nervous system (CNS) of the third instar larva is the most convenient tissue in which to examine both mitotic chromosomes and the diploid interphase nucleus. It contains a mixture of cell types at various degrees of differentiation. Here, methods for examining the diploid nuclei of the third instar larva are presented. One method employs BrdU incorporation to label nuclei during the S-phase. A second uses fluorescence in situ hybridization (FISH) to determine where certain sequences are located. Both can be used on either mitotic chromosomes or interphase nuclei. These two methods can be used by themselves or in combination. When used in combination, a researcher can identify which cells have recently undergone the S-phase and examine the specific positions of various chromosomal regions in the interphase nucleus. development can then be addressed. Changes in nuclear organization during the cell cycle has been extensively studied during the blastoderm stage of embryogenesis (1). However, there are a number of features of this stage that are exceptional. The cells are undergoing an unusually rapid cell cycle and have little or no G1 stage. They remain in the Rabl orientation, an organization that is often not found in nuclei from cells of more mature tissue. Finally, the level of transcription is low, which may influence the position of a specific chromosomal region (2). In this chapter, a procedure for FISH to larval CNS cells is presented. This procedure is very similar to a number of other procedures that have been previously published for both polytene and interphase nuclei (3-5), but is one known to be compatible with BrdU labeling of nuclei. The combined FISH-BrdU method simply includes the anti-BrdU antibody at the final step. A procedure for doing only BrdU is also included. Precise methods for the BrdU feeding of larvae are described, as well as a way to pulse-feed larvae with BrdU. This procedure has been combined with quantitative analysis of 4',6-diamidine-2-phenylindole (DAPI) fluorescence to more precisely determine the cell cycle stage of individual nuclei in a squash. Although this aspect of the technique is not discussed here, a discussion of this application can be found in ref. 6.